We are often asked what the safest way to get rid of Wasp Nests is. Our answer is always ‘Let Anypest Do it.’ The reasoning is simple, removing wasp nests is dangerous. What Are Wasps and how do Wasps differ than Bees? Wasps differ than bees in several ways. First of all they are more medium sized, and have longer bodies. Secondly, they aren’t pollinators, so they don’t have furry little bodies. Thirdly, they also don’t make honey, but rather their nests are made out of paper. Finally a wasp can sting you multiple times, and unlike a honey bee they won’t die after they sting you. A wasp nest is usually made out of a grey paper like substance that is chewed up wood pulp mixed with their saliva. They tend to make them in spots such as under your eavesdrops, in barns, in the rafters of garden sheds, in your garage’s light housing, or in trees and shrubs. You’ll also find wasps nesting in attics if they can get in. If they are in your attic or walls, you will hear them crawling and chewing at night when it is quiet. These nests get quite large, and can actually fall through your ceiling as the bees chew at the wood to make their nest grow larger. Generally you’ll see the paper like nests in secluded areas around your property. Wasps generally aren’t dangerous unless they are trying to protect their nest. If that happens, the wasps will swarm you and sting you multiple times. The problem is that the majority of the time, you won’t know if you are dangerously close to a wasp nest. You usually stumble upon them while you’re getting a golf ball from the rough, in your shed changing a light-bulb or doing a little weed wacking around some shrubs. If you have an allergy to wasps, you’ll need to seek medical attention immediately. If your child is stung, be sure to bring them to a doctor as symptoms of allergic reactions aren’t often immediate. A child may not be able to tell you if they are feeling funny or that their throat is swelling. If your child, or anyone is showing any symptoms, call 911 immediately with your name, address and what the exact symptoms are (swelling, dizziness and difficulty breathing). Wasps typically leave their nests in the late fall and winter when it is cold. It is generally safe to remove the nest then, but we still recommend you call us, or use extreme caution. Sometimes you’ll see a small wasp nest, about the size of Loonie forming. While it’s not safe to scrape this off by hand, a lot of people use a garden hose to knock down this base if they see it on the side of their home. It is never safe to remove a nest if it large as Wasps are social creatures and they will all swarm you with the intent of stinging you. What about Yellow Jackets or Hornets? Yellow Jackets and Hornets are types of wasps and the same principals apply to them. While wasps do not sleep, they work in their nests at night. Yellow Jackets, on the other hand, are known to fly around at night. Yellow Jackets (and wasps) eat meat, meaning they are excellent for pest control. Where am I most likely to find Wasps in Southern Ontario? Wherever there is wood, you’ll find wasps as they build their nests out of chewed up wood pulp. 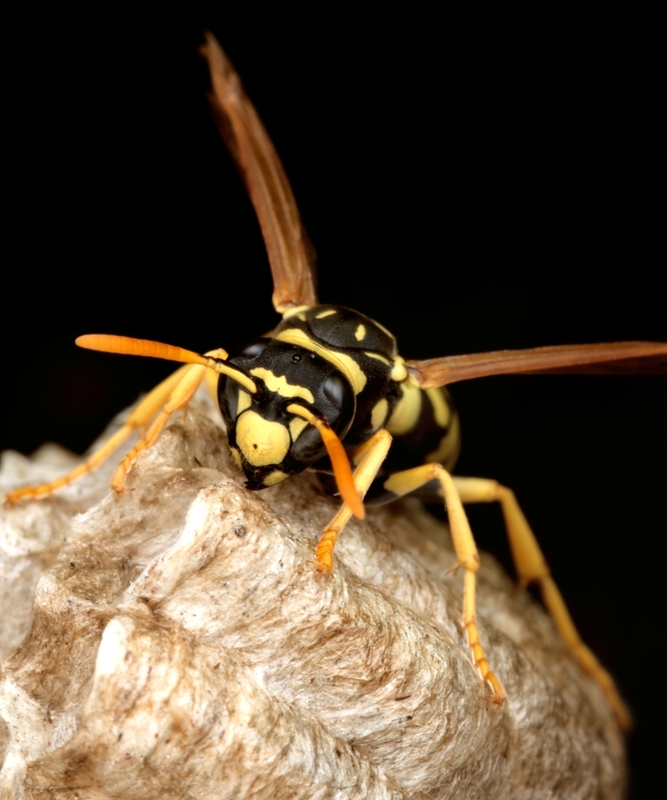 If you live near one of the many golf courses, or near an apple orchard, along the Bruce Trail, or close to the Royal Botanical Gardens, you’ll be prone to have wasps nests. The same goes for if you live near a park or high school as kids often eat a lot of foods that wasps love (meaty hamburgers, greasy hot dogs, pop) that wasps will flock to in the garbage bins. Other tactics you can take is to paint or stain any untreated wood you may have. If you have a shed where the wood is exposed on a window sill, give it a nice coat of paint. If you see yellow jackets or wasps flying around your home, take a look at their flight patterns. If they are constantly flying around your window, chances are you have a nest inside your home. If you spot them around a tree or a shrub, keep your distance from that area to avoid getting stung. If you were looking for DIY Wasp Nest Removal, you came to the wrong page. Wasps stings can be lethal, so it’s best to leave it to us to remove the nest. We will do it fast, and without any inconvenience to you. We will also look around your property and suggest ways to prevent wasps from coming back. This entry was posted in Blog and tagged wasp nests, Wasps on 2014/07/21 by Any Pest.